Underground metal piping systems need protection from corrosive soils for a long-term reliable system. The Gilsulate500XR material was invented and patented with the ability of providing corrosion protection to raw uncoated metallic structures/pipes. Soil’s naturally corrosive nature plays an integral role in direct buried piping systems. 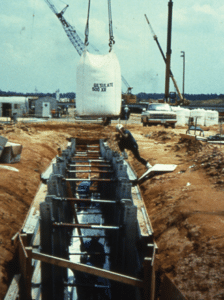 The National Association of Corrosion Engineers (NACE) published decades ago a guideline of possible corrosion rates in homogenous soil. Soils generally have an OHM-CM range from below 500 to above 10,000. Soils with electrical resistivity over 50,000 OHM-CM are believed to allow only trace corrosion. The Department of Energy uses patented Gilsulate500XR® as part of their standard practices for corrosion protection to their radioactive waste transfer lines. *Buried, non-insulated, Stainless Steel and Carbon Steel Piping and buried Carbon Steel Piping encapsulated in Gilsulate 500XR® (High Performance Coating System HP-11). Gilsulate500XR provides an environment that encapsulates and envelops the pipe without seams, jacketing or joints. Not only does the Gilsulate500XR isolate the pipe from potentially corrosive soil and its variability but the product’s very high electrical resistivity (measurement that determines the ability of a material to prevent corrosion of metal) prevents the transmission of stray electrical currents found in soils through the Gilsulate500XR material. Gilsulate 500XR has an electrical resistivity greater than 1,000,000,000,000 OHM-CM therefore providing a stable environment and corrosion protection for underground systems without the need of typical cathodic protection such as sacrificial anode systems. Gilsulate International, Inc., announced on December 28, 2016 that it has acquired the assets of Dritherm International, Inc.
We are focused on our customer’s ultimate success. As such, it is our guiding principal to provide our customers with the highest quality products, on time and at competitive prices. Our primary focus is to provide the very best in customer service while achieving excellence in our every endeavor.